Graeme McDowell and caddie Ken Comboy at Valderrama last week. 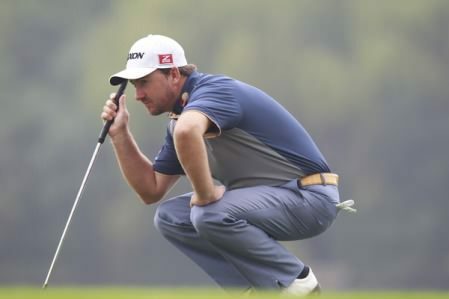 Picture/www.golffile.ieGraeme McDowell took an important step on the road to recovery from what he called “one of the more embarrassing weekends I’ve ever had in my golf career” by opening with a gutsy, three under 69 in the WGC-HSBC Champions in Shanghai. 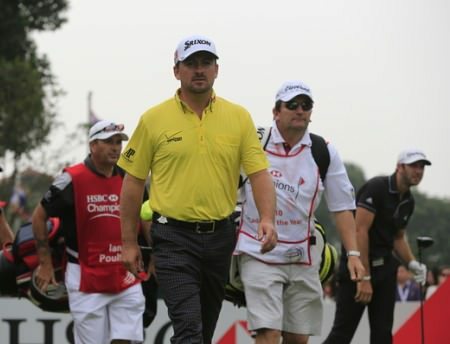 After shooting successive rounds of 81 and 82 at Valderrama to finish 31 strokes behind Sergio Garcia in the Andalucia Masters last weekend, McDowell could have been forgiven for heading back to Orlando for some winter R&R instead on embarking on a five week-run in Asia and South Africa. Enticed by golf’s promise of a new dawn every Thursday, McDowell worked on his game with Pete Cowe and raced to four under through seven holes before suddenly finding himself back where he started when he tripled the 17th, his eighth, and then bogeyed the first. After admitting to “throwing in the towel” over the final 27 holes in Spain, he did the opposite in China and finished strongly with birdies at the second, third and fifth to end the day four shots behind “PGA Tour Player of the Year” contender and US PGA champion Keegan Bradley, who shot a brilliant 65. “Last weekend at Valderrama was probably one of the more embarrassing weekends I’ve ever had in my golf career, and Valderrama can do that to you. I threw the towel in a little bit the last 27 holes, and like I say it was embarrassing for me. McDowell knew that capping a career year was always going to be complicated and proved it by missing the cut in three of the four majors. But as he pointed out, he had at least two great chances to win with Sawgrass and St Andrews springing readily to mind. “The lows have felt low this year but they really shouldn’t, if I look back at last year and the highs were very high last year and the lows shouldn’t feel that bad. That’s the thing about this game, we often don’t give ourselves credit when credit is due, but we are pretty good at beating ourselves up. I think if you asked every player in this field, if they would be better at beating themselves up or giving themselves credit, they would agree with me. Apart from his own high expectations, McDowell’s biggest problem has been his inability to shape the ball at will this year. “I knew that last week at Valderrama, I could not aim for the right side of the golf course because I couldn’t rely on my draw and I couldn’t aim at the left side of the golf course because I had no fade. So I had no shot in the bag. And that’s how I had to play golf last week —and I couldn’t make a putt either. “I haven’t controlled the golf ball like I controlled it last year, and when I say control, I mean, aiming at a target. I’ve been able to shape it off that target. That’s what I did great last year and that’s what I haven’t done well this year. I really —the range session I had with Pete on Tuesday reminded me a lot of the range sessions we had last year. There are reasons I haven’t been able to do that this year and for the first time on Tuesday, I really felt my old self come back a little bit again. The triple bogey at the 17th could have derailed McDowell completely but he was understandably proud of the way he came back to end the day tied for ninth. Bradley leads by two from Bo Van Pelt, Freddie Jacobson and Alex Noren with Rory McIlroy tied 19th on two under after a 70 that required two birdies in his last four. Darren Clarke shot a one over 73 while debutant Michael Hoey signed for a four over 76. McIlroy and McDowell at the 2010 Ryder Cup. Picture Eoin Clarke/www.golffile.ieGraeme McDowell reckons Rory McIlroy’s $2 million Shanghai cash scoop might just shut up the Holywood star’s critics for a while. Steve Williams and Adam Scott celebrate in Akron this summer. Picture www.golffile.ieRory McIlroy and Graeme McDowell are in contention for the WGC-HSBC Champions but that’s not going to push Steve Williams off the back pages with the furore over his insulting remarks about ex-employer Tiger Woods unlikely to die down anytime soon.